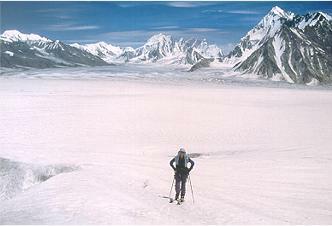 Snow Lake is at 4700m (15,500 ft), which is high for a Base Camp. It is an immense area. We were frequently deceived by how big distances were (or by how slow we moved, I'm not sure which). Even though our base camp was quite a large complex, we only needed to go about 30 minutes from camp before it became a tiny dot lost in the immensity. As mentioned earlier, the Snow Lake area is about 70 square kilometres - split about 50-50 between Snow Lake proper (head of the Biafo) and the Sim Gang, a large side glacier. Here is another map. The ice has supposedly been measured at 1.5km thick. Only the top 100 hundred feet (or less) is snow. And mountains? 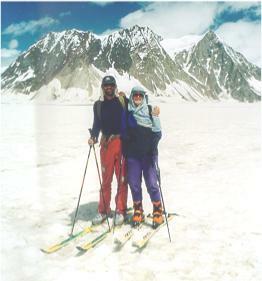 The area is surrounded by large number of very spectacular peaks. 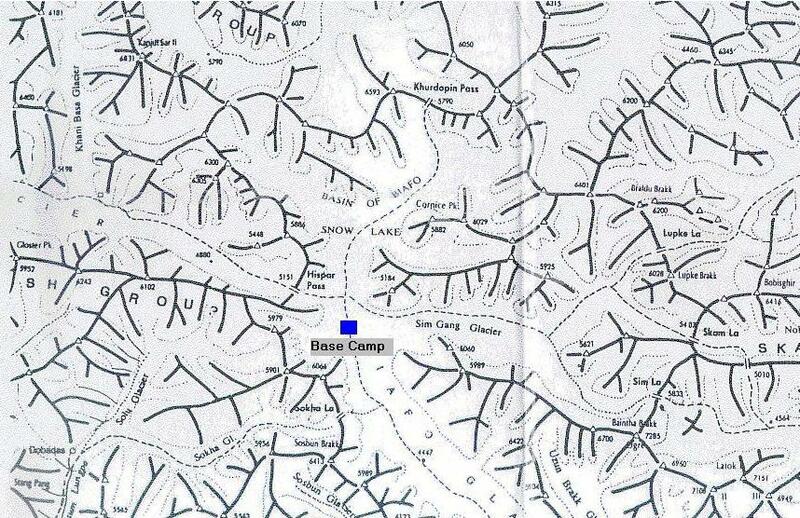 Our maps had only shown a few of these so we were a bit overwhelmed by possibilities. 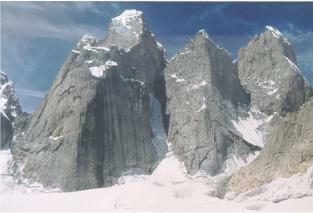 Over 90% of these would be unnamed and unclimbed ... and not easy. If you came prepared and equiped for hard climbing you would have a field day. Assuming you get good conditions (which we didn't). One of the first things which struck me when we arrived was how dry the peaks were. It had been a very dry winter and not much snow had fallen. Everything was very bare. The Sim Gang (which we got a very good view of from our BC) looked like Otago at the end of a long dry summer. Bare scree ridges and snowless glaciers; it looked nothing like the photos we had seen of graceful snow ridges and peaks. Later on we did a side-trip up the Sim Gang to discover, to our shock and horror, that there was no snow on the Sim Gang at all. 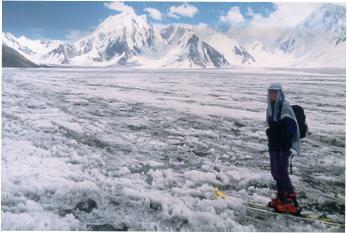 It was bare rough glacial ice (not a lot of fun for ski touring). Anyone who has been to this area before would find it hard to believe. The main thing which put a stopper on our plans was the weather. 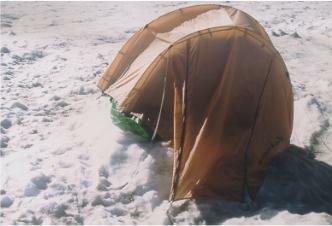 We had only just arrived at Base Camp before we discovered how unsettled it was. We were just starting to organise our gear when a squall swept up-valley and it started to rain. Rain??? At this altitude? I could hardly believe it. I expected the odd blizzard but not rain. We had very unsettled weather for the first two weeks. It turned out that the monsoon had swept further north than usual to hit the northern part of Pakistan (I shouldn't complain, as it was good for the farmers and they certainly needed rain much more than we needed fine weather). It was very demoralising for those trying to do things. The weather often looked quite promising for long enough to sucker people out from camp, then dump on them for the two or three days. While Beth and I weren't trying to do much at this stage, it must have been hugely frustrating for those that were. Then, in the last week, the weather came right and we had 5 days of perfect weather. For the first time we saw the Ogre (the high peak in the area) which had been hidden from us. Some other the others were able to get some climbing was done, however many were too worn down from abortive trips during the bad weather period. This was the other major factor that affected us at Base Camp. My health in particular got progressively worse. I was suffering from the same condition as Beth, lack of appetite, though initially not as severe. On the walk in I had eaten a little bit, though not a lot. 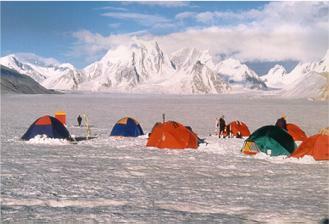 The idea was that we would be able to rest at BC, get fully acclimatised and start to recover. However this just didn't happen. The problem was that it wasn't obvious, to anybody, that I had a stomach bug. Loss of appetite is one of the main symptons of altitude and we all thought that this was the problem; and that it would go away as my acclimatisation improved. This didn't happen, in fact it got worse and I got weaker and weaker. Example of a typical days food: breakfast - two small (300ml) bowls of thin porridge, lunch - a bowl of canned fruit and a cheese segment (the highlight of the day), dinner - two mugs of soup and maybe a a spoonful or two of rice. Hardly enough to feed a sparrow. This went on for 2 to 3 weeks. By the second week it started to get worse. I would get nauseas whenever I thought of food, and thew up whenever I tried to eat dinner (breakfast and lunch weren't a problem for some reason).. This went on for four or five days; it was the lowest point on the trip for me. It also coincided with a three-day period when it rained or snowed continuously (most other days would have an hour or two when it was fine) and I started to think that I'd rather be somewhere else. We realised how serious the situation was. I needed to be able to walk out, but I hardly had enough energy to get to the mess tent. Helicopter evacuation was not an option. So we decided to take a punt, even though there were no real symptons that I had a stomach infection, we decided we should treat it in case I did. I started on a course of antibiotics and, within two days, was starting to return to normal. It was a great moment when I was able to eat some dinner without having to rush out of the tent. I was still extremely weak, and my stomach was very uncertain about things for the next week or two, however I was on the mend. Our focus now became getting a lot of food into me, so I'd be strong enough to get over the pass and down the Hispar. For the last week there I tried to eat as much as I could, in between day trips in the fine weather. By the end of this I was starting to feel a bit more functional. Enough of me. Beth was having her own problems. While she had shaken off the stomach problem, was eating well and seemed to be well acclimatised, her breathing wasn't all that good. We're not sure whether this was due to her being an asthmatic, or having a minor lung infection. Maybe the Burdett body just wasn't designed to operate at altitude. Well Beth and I didn't do any, but I'll at least mention what the others got up to. Not a great deal as it turned out. The weather really stuffed them up. The other problem facing people climbing in this area is that distances are so huge. 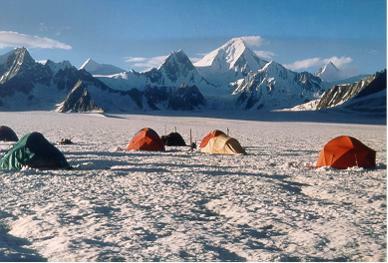 There are very few peaks which you can do easily from Base Camp. You have to, at least, do an overnight trip, if not a multi-day one. This makes it very difficult when the weather is unsettled - you can easily be lured out by a brief period of fine weather then get dumped on. This is what happened several times. They also, in my opinion, tried to do too much too soon. It's easy to underestimate how draining it is to climb at altitude; and after the first couple of abortive forays many of them were so worn out they weren't able to do a lot when the weather did improve. Finally (this doesn't get any better), the peaks were in pretty bad condition, possibly because it was so warm. By about 10:30am the snow slopes turned to mush and started sloughing off. At least one climb got stopped by this. So what got done? Dave, Toby and Alistair, in various combinations, did a couple of routes on a funny little peak to the west of the camp. We called this Rabbit peak (as this is what it looked like). Most of the others climbed a little bump, 5184, above the Sim Gang junction. Some of them did it twice. Dave and Toby climbed Workman's peak on a stunningly fine day and raved about the incredible views. Maybe Toby will email a photo of this so I can include it here? A couple of days later they climbed to within a stones-throw of the summit of Cornice peak, finding it a demanding climb. You won't find this word in your dictionary. Here is another one you may not be familiar with - ablation. Ablation is the process by which snow melts/disappears, due to the intense sun and low humidity at altitude. This happens everywhere, but here it was extreme. We were loosing about 2 feet of snow per week. But not under our tents.Within a very short space of time you would find that your tent, which used to be sitting on the ground, was now sitting on top of a two-foot high pedestal. To make it worse, the sides of the pedestal would melt inwards, so the floor space inside the tent would gradually diminish. The outer walls of the tent would often be sitting on the ground, masking the pedestal which was steadily growing and pushing the inhabitants toward the ceiling of the tent. This was a major pain. We had to relocate our tents every week. The camping area became littered with dead pedestals, making it a major obstacle course to navigate. The ablation also meant that buried objects didn't remain buried very long, but would constantly come back to haunt you. The only thing we buried was our, ahem, human waste. Our first loo-hole was three feet deep. Two weeks later the "material" was a foot above the surface, on it's own little pedestal. I'll spare you the photo. Needless to say it was re-buried. Several times. Well our time finally came to and end, and our porters arrived from Hispar (the village we were walking out to). However just at this moment our fine weather spell came to a dramatic end. Wind and heavy rain; it was totally foul. The barometer dropped to the lowest we had seen it. We lay in our tents wondering if we were ever going to get out of this place. The plan was to leave at midnight. The walk over the pass was expected to be a long day and we needed to leave as early as possible. At midnight it was still raining so it was back to bed. At 1:30am it was looking better, so we got up and forced down some breakfast. By 3am we were away.